We offer affordable bat removal in Louisville, Kentucky. As a fully insured and trained company, we have performed hundreds of bat control jobs every year for the past 20 years. We extract bats from residential and commercial properties, as well as, implement methods to prevent them from coming back. To remove bats effectively from your home, trust a professional that understands the species and their behaviors very well. Call us today to discuss bat removal options for your residential or commercial property in Louisville, Kentucky. Having a bat in the attic in Louisville, KY can be quite frustrating and could potentially cause costly structural damage to your home. If you suspect one or more bats are dwelling in your attic, give us a call right away at 502-553-7622. 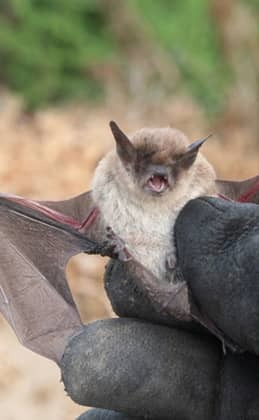 We are experienced and fully insured bat removal specialists with over 15 years of experience in the bat control industry. We will extract bats from your home safely and humanely, and prevent them from coming back. So if you have a bat in the attic of your Louisville, KY home, call us right away!